M.L. 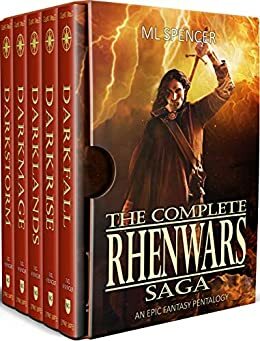 Spencer is especially proud of The Complete Rhenwars Saga, now all five books in her epic fantasy penology can be purchased together. The collection was released in December 2018, and is a bestseller on Amazon, a stellar achievement. The second book is a massive plot twist on the premised in the first novel, so it was important to Spencer that readers could access all the books in one tome. Spencer cautions to not make the assumption that the fantasy genre is only for the young adult audience. Her books are written for a mature audience. 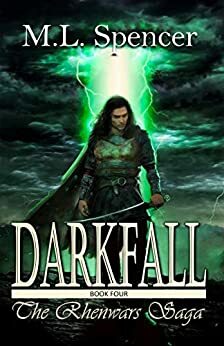 For this series, the readership is mostly male and each book starts with the word “dark:” Darkfall, Darkmage, Darklands, Darkrise, Darkstorm. There is a reason for that. Inspiration for the first book was triggered by 9/11. When the event happened, Spencer wondered who would fly planes into a building, and what reasons could someone have for such an act? Spencer expanded the question by creating an advanced society where she could dabble with alternate perspectives of heroes and villains. Her works take the reader into morally gray areas which are sometimes political, uncomfortable or laced with graphic violence. Her topics are difficult to research and she has wondered if her internet search history puts her on any FBI watch lists! As a writer, Spencer invests in two things; professional cover art and professional editing. She credits the success of her fantasy series to the quality of the thumbnail. It makes it easy to select from a web page. The cover is an unusual color—a rich gradient orange so words pop and a provocative figure in the middle of the cover draws the eye. Spencer says some writers search for the next bestselling book cover and pen a story to match the cover. (Yes, you can judge a book by its cover!) Spencer spends a few thousand dollars on two editors, a developmental editor and the other for copy editing. It helps when manuscripts are exceptionally clean. And it certainly works for her, too. The compelling book cover gets her books downloaded into a reader’s hands, and quality of her writing ensures that the book stays there. 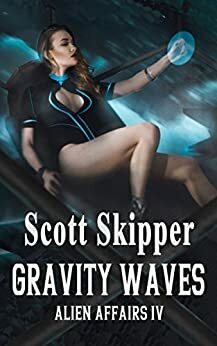 Gravity Waves is the fourth book in the series, Alien Affair. The initial idea came to Scott Skipper after a visit to the museum at Roswell, New Mexico. Although not entirely convinced by the exhibits in the museum, Skipper asked himself the question “what if all that stuff really did happen?” He delved into alien research, including works by Stephen Hawking, A Brief history of Time. The notion of different speeds and places in spacetime curvature, those popular concepts of warp speed and time travel developed into a story. Skipper enjoys creating thrillers and characters with a wicked life, sometimes adding political and satirical touches. Of his fifteen publications, Aliens Affairs is his favorite series. He enjoys the female protagonist he created, so much so that it has been suggested that he as an unnatural desire for the main character! Skipper is a “dyed in the wool” self publisher. Like many authors, he got sick of hearing the response “this is not what we are looking for at this time.” He is also a prolific writer, full of ideas and with the daily discipline to write quickly, and feels that he doesn’t have the time to wait six months for agent and publishing house approvals in order to move ahead with his projects. He sets his own timeline with tight turnaround and enjoys making decisions about artwork, design and content. SJ White is inspired by stories of other people. When something tickles her fancy, she does research and soon that story is incorporated into a new book. 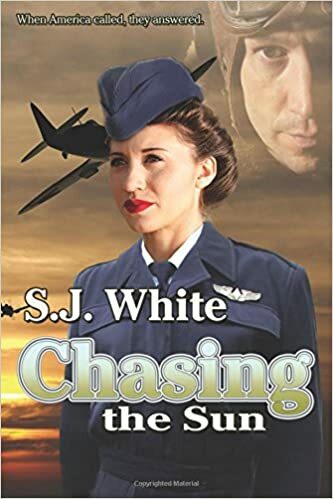 Chasing the Sun was inspired by female Air Force pilots in World War Two. In 2018 she published two other historical fiction novels, Borrowed Time and Scandalous. Of all her books, Fire and Sword was the most difficult to research because it involved her own ancestors in Scotland. She had to generate a plot with historically accurate timelines and flesh out the reasons for their choices, some of which were not very good. She became so invested in the life of the protagonist, a distant relative, that when it came time to kill him off, she was crying over the pages. Her writing tip is to scour the first draft to eliminate any usage of the passive voice, it moves the plot and keeps readers engaged. 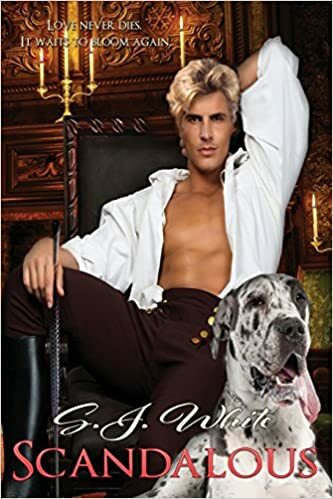 White has romance in her novels and all romance writers pay particular attention to book covers—and the selection of the very best male model. What female author would not enjoy that task? White completes her projects within twelve months, from cover to content, and for this reason she has never considered anything but self-publishing. Herb Williams is a non-fiction writer who released his fifth book in 2018, drawing inspiration from his travels and personal life, and writing as a pastime. His work is filled with humor and with an eye to the oddities in life. In his latest book, Echoes from Down Under Williams researched many critters in Australia. It is a land where there are as many deadly animals on land, spiders—as there are in water—beware of slimy snails. Besides poisonous creatures, the continent breeds many unique species; egg laying mammals and flightless Kiwi birds, the female kiwi can lay an egg as big as herself. Ouch! The human inhabitants are unique, too. Australia is the only place that has bottomless boat races, where people across land inside boats with no bottom. It’s a wild race, and it helps to have a drink or two. Williams doesn’t have good writing habits to share with other writers. His writing day begins with a cup of coffee, a check on the weather, extensive perusing of news, email, and anything else that helps with procrastination. He doesn’t have a fancy studio either, he and his wife share a cluttered room. But that room is so crammed full of ideas that writer block is never a problem and despite his best efforts, Williams gets the writing done. He will go through four to five drafts before he sends it to his editor. Williams tip is to remember that nothing in the publishing world is free and authors do all their own marketing. Ten years ago, in order to keep printing costs down, print runs were done by volume. Williams would have printed several thousand copies of each book and stored them in his garage. He appreciates the electronic world with print on demand options. Book are printed and made when they are ordered. Who pays for a printed book? The readers do. Readers can invest in William’s writing career by purchasing his book at Barnes and Noble; more often than not, Williams buys his own books to resell at book fairs, or out of the back of his car. He doesn’t trouble with traditional publishing houses because he knows they slow down the process and he’ll end up doing all their marketing anyway. The old adage is to write from what you know and that is where author Kenneth L Decroo, will triage for book ideas. In his past life, Decroo worked with animal training for motion film projects and the circus. It seemed that whenever he was working with chimpanzees, everyone commented that “your chimps seem so human-like.” He put on his professor hat and did some investigating. He discovered that chimpanzees and humans are very close in biology, closer than gorillas, and close enough in blood lines that the two species can could exchange blood in transfusions. When he related this information to people, the next question was, “could the two species cross-breed?” So he did more research and found out about controversial cross-breeding experiments and about a ship that sunk with a mysterious, clandestine cargo aboard. This research became the basis for his books Becoming Human and Almost Human, which was published in June 2018. Decroo has a separate writing studio with a great view of Lake Arrowhead but the view is not as inspirational as one might think, in order to get into “the zone” he has to close the curtains. He is a morning writer, writing at night if he cannot sleep. Decroo follows the advice of Stephen King “write with the door closed, rewrite with the door open.” He produces a first draft of the entire story flow, and the second draft is meant to be critiqued. Over the years, he learned that he is a better storyteller than grammarian so he uses an editor and publishes through a small press. Decroo is taking a university level editor certification class, so his manuscripts improved but he warns the writer to never let the editing get in the way of the writing. Decroo creates plot, characters and scenes when he is on his motorcycle, touring. Once back at his studio, he puts it all together. 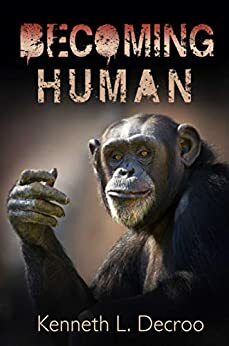 His research easily informs the next book, currently he is reading about Yeti and Bigfoot in preparation for the last book in his trilogy, Becoming More Than Human.